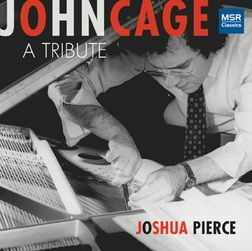 Pianist Joshua Pierce’s John Cage, A Tribute is an essential collection, especially as it commemorates the composer’s centenary. It opens with the composer’s 1944 score Four Walls - Act I and Act 2, composed in collaboration with Merce Cunningham’s dance play. As is noted in this essential two-disc set it is a fine essay about the music, Eric Salzman makes the case that along with Debussy, Ravel, Rachmaninoff, Prokofiev, and Bartók, Cage belongs in the pantheon of 20th century composers with an important, original catalogue of work for piano. In the 20 sections of Four Walls Pierce essays the austere soundscape that alternates with warm, supple, serene piano lines. Cage’s narrative, is in fact, a diatonic scenario of a family in crisis. Episodes of lingering silence and a scene in which tenor Robert White sings about “black nightingales” and “Sweet love/my throat is gurgling/the mystic mouth.” The bleakness is overrun by two “dance” interludes that are more than just propulsive, they have a raw musicality, or counter-musicality, and you can only imagine how figures, spontaneously appear in Cunningham’s choreography. Act II has even more musical menace and it was easy to summon images of Martha Graham actually, who would have been more literal in expressing Cage’s severity and abstract psyche. The piece illustrates how key dance is in understanding the full scope of these compositions. Pierce includes spellbinding brief Cage compositions in their first recordings on this collection- the ethereal Quest (1935), Our Spring Will Come (1948)- with its clipped percussive drive sounding like a b-horror film and Three Early Songs, from 1933, seem more self-consciously “conservatoire” compositions, although they are not only instructive to American art songs of a generation later in sound and cleverness. They seem detached on this recording, but Mr. White belts “em out like 11’oclock theater numbers”. On Two Pieces for Piano a brooding keyboard meditation seems to hover with Cage’s ghost in Pierce’s whispering tones. The American Festival of Microtonal Music Ensemble collaborates with Pierce on the abstract realms of Piano Sextet Prelude for Six Instruments in A Minor, for violin, flute, violincello, bassoon and trumpet, adds psychological drapery, whether implied or inferred, can be easily cast aside. Note clusters and vanish, chromatic clouds float by and elegant piano line comes, strings reverse, the horn wends shrilly to a serene flute line, just to name a few effects. It is quintessential Cage that just is self-defining. In the Name of the Holocaust from 1942, with its damaged piano aura of hollow strums and distant tinny bangs, Cage’s insistent development of a marred harpsichord effect, is a stunning composition and in Pierce’s hands, completely realized. Salzman writes that Cage meant it to reference the James Joyce book Finnegan’s Wake and the composer’s Catholic upbringing, not Nazi persecution. Ophelia, in contrast, is a linear dance score, performed with volcanic, understated clarity by Pierce, seems like a keyboard mad scene, and is in fact a straightforward dance score. As dramatic as Cage is on this, it is easy to believe that he is brilliantly parodying styles of the time, even his own. The highlight on this set is the transcendent performance by Pierce of Sonatas and Interludes for prepared piano. It must be an enhanced experience live, but without doubt, Pierce gives this completely realized dimensions in the studio. His prepared piano, as per Cage’s instructions, has bolts, screws, nuts, an eraser, plastics- create eerie effects and in the denser sections can read as Balinese gamelan or ancient Japanese strings and other instruments. Salzman notes that the sonatas and interludes are structured exactly like those of Domenico Scarlatti. Cage is in fact writing his own chapters about the sonata form. Like the energy that gamelan conjures, the sonatas have such primal tranquility and elegance. The progressions, spacey resolves and chromatic bursts are indelibly Cage. Some of the darker seeming moments may not be the intent at all, it could just be a soundscape devoid of sensorial observation. A good example is the earthy mysticism of a two part sonata named Gemini inspired by a sculpture by Richard Lippold. This pivotal work from the late 40s cued the NYTs to dub Cage one of the most American composers of his generation, and now it can also be observed that it is destined to be timeless. This collection will certainly second that.